Your Bloodhound is highly athletic with plenty of curiosity about the world. That stocky athletic build needs proper protein to keep up muscle tone. As a large breed, it’s vital that they don’t add extra pounds by eating a cheap food filled with empty calories. Bloodhounds are soulful and easily one of the most recognizable dog breeds. They have a sweet disposition and are part of the scent hound group. They’re typically mild-mannered but show a lot of determination when on the hunt (whether with you or exploring in the yard). They can be quite a challenge due to slow maturity and a fierce independent streak. Though you may not be able to train your bloodhound to be off-leash except in the most secure areas, you can give your curious companion excellent nutrition that will support its muscular body and sharp mind. Bloodhounds also need foods that can help support skin health. With the folds in their faces and short hair, they can sometimes develop skin irritations and inflammation. Fatty acids in well-made foods can help keep skin irritation at bay. Other vitamins and antioxidants help support the immune and digestive function, which can also affect the health of the skin and ears. Bloodhounds are considered large breeds, which have specific health concerns to watch out for. Bloodhounds also have some health issues particular to the breed. Let’s look at some things you should be watching for. A potentially dangerous condition common to large breed, barrel-chested dogs is Bloat. This condition happens when the stomach distends and twists, causing pain and eventual death if left untreated. A quality diet helps prevent bloat by allowing you to feed smaller meals throughout the day without your bloodhound losing energy. It also helps promote proper digestion. Large breed dogs are also prone to a genetic condition called Hip Dysplasia. The joint fails to form correctly and can pop more easily out of place later on in life with harsh activity or excessive weight gain. Your Bloodhound should always maintain a proper weight, which can be hard with cheap food, and should have enough protein to support muscle tone to support the joint. Glucosamine and chondroitin can also help cushion the joint and protect it from the aging process. Their coat is short, and their ears are long. This leads to a lot of infections because the ears tend to drag the ground or into their water bowl where bacteria can latch on. The short hair gives things pretty much free access to soft, warm places like ears or the folds of skin. Foods with balanced nutrition and fatty acids help keep away the worst effects if inflammation and irritation though you’ll have to spend some time making sure those areas stay clean and free of odor. Protein is one of the most important essentials in your Bloodhound’s food. It should come from a whole source and be the first ingredient on the list. Byproduct meals are frequently used as a cheap protein, but you’re looking for things like whole deboned chicken or salmon. Protein from these sources better supports essential muscle groups. Whole fruits and vegetables provide essential vitamins and antioxidants that can support the immune system. They also provide crucial fiber to keep digestion under control. Together, these two systems can offer further support to the skin and soft tissues. Supplements like fatty acids can help keep the skin and coat healthy and maintain mental processing. Glucosamine and chondroitin help the joints stay lubricated and healthy. Other considerations would be minerals for bones and teeth and probiotics for digestion. If your Bloodhound has a lot of issues with skin and ear irritations, you may want to switch to a limited ingredient food to help alleviate any inflammation. These use a single source of protein with a few other ingredients to get your Bloodhound’s digestion and immune response back on track. Cheap fillers such as corn and soy can cause a lot of skin irritation. They’re frequent allergy offenders and often get put into foods to help bring down the cost of both production and retail. They offer no nutritional benefit and shouldn’t be listed anywhere on the dog food bag. Other ingredients to avoid entirely would be the cheap proteins that come from by-product meals, and alternative flavors, which can encourage your Bloodhound to eat too quickly. Artificial colors can react negatively with your dog’s stomach and are only there for your benefit. One worrying bit of news concerns foods that use potatoes, peas, and legumes as ingredients. These often substitute for grain in gluten-free foods, but they could have a link to a condition called Canine Dilated Cardiomyopathy. We aren’t entirely sure what’s going on yet, but you should talk to your vet about avoiding foods with these ingredients altogether or avoiding foods at least without them in the first two or three ingredient places. Of course, we’re going to call out a few brands we continue to see on the shelves despite a lack of quality ingredients and a lot of empty fillers. Kibbles N Bits: This one uses just about every ingredient we listed to avoid. Artificial colors and flavors, cheap fillers such as corn or soy, and by-product meals. It’s not worth it because you’ll be in the vet’s office a lot. Alpo: It’s been recalled so many times we can’t even remember. It uses cheap fillers in both its wet and dry options. 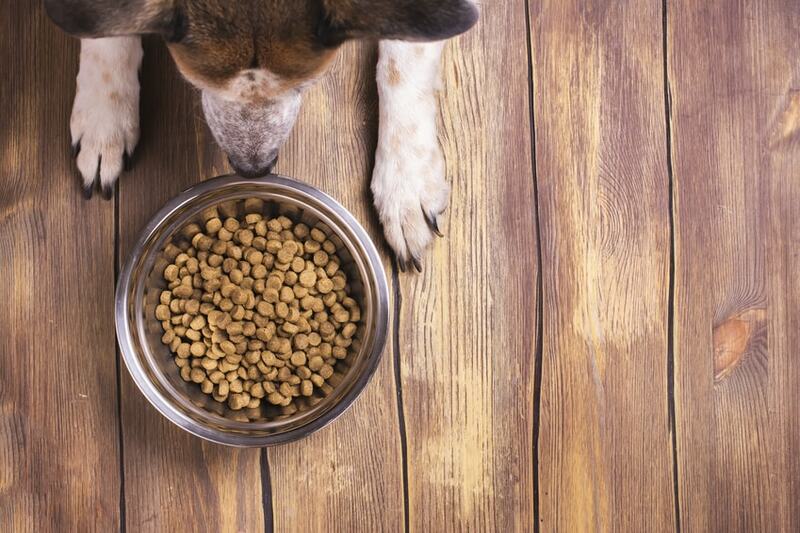 Dogs might love their wet food, but we promise you won’t be happy. Beneful by Purina: Beneful uses cheap fillers in many of their formulas and unidentified meat products in others. It may be cheap, but it won’t be an excellent long term investment. Bloodhounds will need dense nutrition to keep up with their energetic personalities. Your vet will give you a plan specific to your Bloodhound, but here are a few general guidelines. Puppies: Bloodhounds are slow growers, which is a good thing. Make sure you control their growth carefully, so you don’t have problems later with bones and joints. Adults: Adult Bloodhounds will have about four cups of food per day divided up into smaller meals. This may help prevent bloat and also give them steady energy throughout the day. Seniors: Seniors will get roughly the same amount of food as their younger counterparts, but your vet may adjust the portion sizes to account for any weight gain and reduced activity. Your Bloodhound should have dense nutrition to keep energy levels up and support strong muscle tone. Weight control is a vital part of your Bloodhound’s entire life so that they can live happily from the very beginning to the golden years. Zignature uses a premium limited ingredient recipe with no cheap fillers or artificial flavors. It’s helpful for dogs with sensitive tummies, so your Bloodhound should be in an excellent position to have better skin and digestion. Whole protein from lamb plus veggies give your Bloodhound all the building blocks for a healthy life. Zignature uses holistic recipes in limited ingredient formulas to help alleviate common allergies and return digestion to normal. They use only premium ingredients and test all recipes in their own kitchens, so you can be confident your pet’s health will improve. Salmon is an excellent source of protein with plenty of fatty acids to support skin health. The recipe is grain free and contains no cheap fillers. It includes Blue Buffalo’s Lifesource bits for all the vitamins and antioxidants your Bloodhound needs to stay healthy and alert. It all started with a family’s love of one unique Airedale Terrier, Blue. Now, Blue Buffalo takes the knowledge gained from searching for the best foods and brings it right to your Bloodhound’s food dish. They never use fillers or cheap ingredients and only want to bring a more natural way for your friend to have as close to the ancestral canine diet as possible. Tasty Turkey Fare is a cooked food that balances the ease of kibble with the nutrition of a raw food diet. It uses just six human grade ingredients to create a balanced meal that will support strong muscles, bones, digestion, and skin health. It’s easier than raw food diets but packs a serious nutritional punch. NomNomNow uses only the freshest ingredients to make their cooked meals, meaning you could practically consume them yourself. All recipes are carefully crafted by a veterinarian using diet principles learned from years in the field. They’re proportioned and come ready to serve or refrigerate. Puppies have changing nutrition needs and should always follow vet instructions for things like portion sizes. You need to control growth carefully so that puppies don’t experience issues with their skeletons or joints later on in life. Taste of the Wild uses a grain-free formula to prevent early allergic reactions and keep your puppy’s weight and growth under control. It uses buffalo for a complete protein source that’s unlikely to cause adverse reactions plus probiotics and vitamins for overall health and better development. Taste of the Wild uses unique formulas to help create what your Bloodhound would have eaten thousands of years ago. They use quality ingredients with whole protein sources to help keep your puppy happy and healthy. Nulo’s wet food is a good additive to dry kibble or as a meal by itself. It uses chicken and salmon as whole sources of protein with plenty of fatty acids to support brain health and proper growth. It also features excellent fiber and moisture content to help keep growth controlled and digestion healthy. Nulo provides premium nutrition for puppies to grow healthy and happy. The company uses only premium quality ingredients for the building blocks for a lifetime of wellbeing and proper growth. Seniors receive similar nutrition to younger Bloodhounds, but if you notice a change in weight or overall activity, your vet may recommend cutting back on food servings. It’s also helpful to have glucosamine and chondroitin to support aging joints and fatty acids to keep the mind sharp. Merrick’s real chicken and sweet potato recipe is not only grain free but also provides plenty of protein to support your aging Bloodhound’s muscles. Sweet potato helps prevent blood sugar spikes and keep weight under control while glucosamine and chondroitin support joints. Essential fatty acids promote skin and soft tissue health while keeping the brain sharp. Merrick is a smaller, US-based company that provides premium foods for a variety of pet sizes and life stages. The company tests all recipes in its own kitchens before release and works hard to deliver foods that will allow your senior to age gracefully. Nutro’s recipe uses pasture-fed lamb, a gentler meat to digest for seniors with allergies to poultry proteins, and rice for slow releasing energy all day. Glucosamine and chondroitin provide support for aging joints while fatty acids encourage peak mental performance. Plus, there are no cheap fillers, artificial flavors, or artificial colors. Nutro has a team of experts creating foods tailored to your pet’s life stage. They use only premium ingredients they can buy and source back to an original supplier so that each stage is accounted for and shown to be the utmost quality. Your Bloodhound is a curious, determined dog with plenty of drive when the scent suits it. Support that drive with healthy foods that support brain development and strong muscle tones without adding a bunch of empty calories that can weigh your dog down (literally). Densely nutritious foods are excellent because you can feed smaller amounts without keeping your Bloodhound hungry all day. Building a lifetime of nutrition helps keep your Bloodhound healthy from the puppy years to the golden ones. Establishing that pattern of health gives you the optimum time with your Bloodhound and keeps things running smoothly for an entire lifetime.